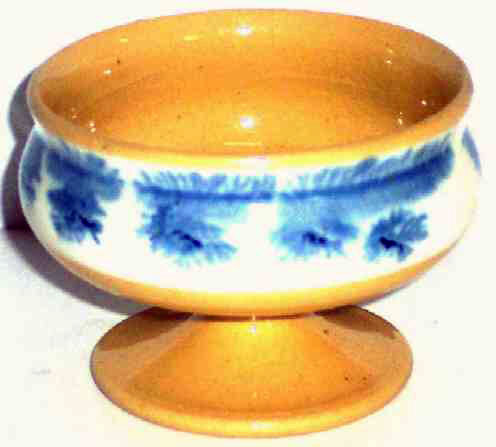 Presented here, a wonderful Mocha decorated Yellow Ware Master Salt with blue dendritic decoration. The color on this piece is gorgeous! The body is that lovely shade of Dijon that we love and the blue is very soft, almost a Wedgwood shade. Note the flare to the rim above the "waist". The condition is high outstanding with no apologies here. It is 2" high and 2-3/4" in diameter. Lovely!